New Scotland manager Alex McLeish has tipped John McGinn and John Souttar to feature for the national team after impressive campaigns for their clubs. McLeish this month returned to the Hampden hotseat 11 years after his previous stint, taking over from Gordon Strachan who stepped aside in October following Scotland’s failure to qualify for the World Cup. The 59-year-old has already had to deal with the news that influential midfielder Scott Brown has retired from international football, but has been encouraged by the talent coming through in the Scottish game. 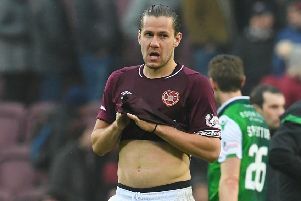 The former Rangers boss, speaking before Brown’s announcement, tipped the likes of Hibs’ McGinn and Hearts defender Souttar to make an immediate impression on the national side with a summer tour to South America planned. “What has been a real breath of fresh air has been the emergence of some players up here in the Scottish Premiership like McGinn at Hibs and Souttar,” he told the Scottish Football Association. On the summer tour, he added: “There will be some kids who haven’t been playing and we could be going out with some new faces. “Some players may be left behind or some of the older players may need a rest and we will have to see what these guys can offer at that level. “Can they deal with it mentally? Do they have the physical and technical abilities to go with it as well? McLeish’s return to Hampden has not been universally popular within the Tartan Army despite an impressive first spell in charge that saw a return of seven wins in 10 matches. He left to take charge at Birmingham in the Premier League and enjoyed some success down there, and while accepting that opinion may be split over his return, he insists he has no regrets over how it ended. “I can understand that opinion will be divided, it’s modern day life,” he explained. “You’re entitled to an opinion and it doesn’t matter what happened, somebody will say something positive and someone will say something negative about my situation. “I went down to England and it was seven months until the next tournament (qualifying) and I was itching to get back to day-to-day coaching and I felt that I couldn’t resist having a go at the Premier League. “Some people ask if I have regrets, but how can I regret having an automatic promotion, a ninth position in the Premier League, a Carling Cup win against Arsenal and keeping Aston Villa in the Premier League?